Bitblox are a celebration of pixels — those eensy data dots that have brought meaning and joy to our lives since the sun-dappled days of Pong. While pixels continue shrinking out of sight on our digital screens, they live on in full chromatic and tactile splendor in these one-of-a-kind alphabet blocks. 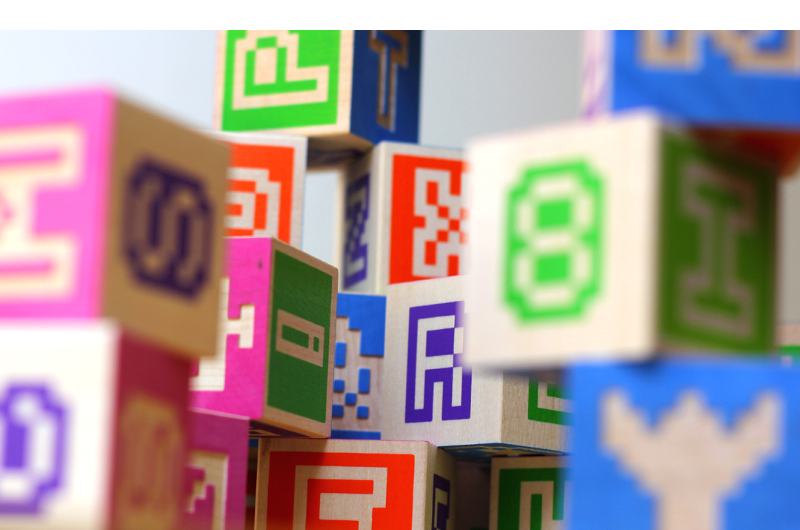 Each set of Bitblox includes 28 alphabet blocks, featuring a total of 168 letters, numbers, symbols and quirky pictograms. Bitblox are a limited-edition item, available exclusively from PSY/OPS & Glyfyx. A numbered and signed Certificate of Authenticity accompanies each set. 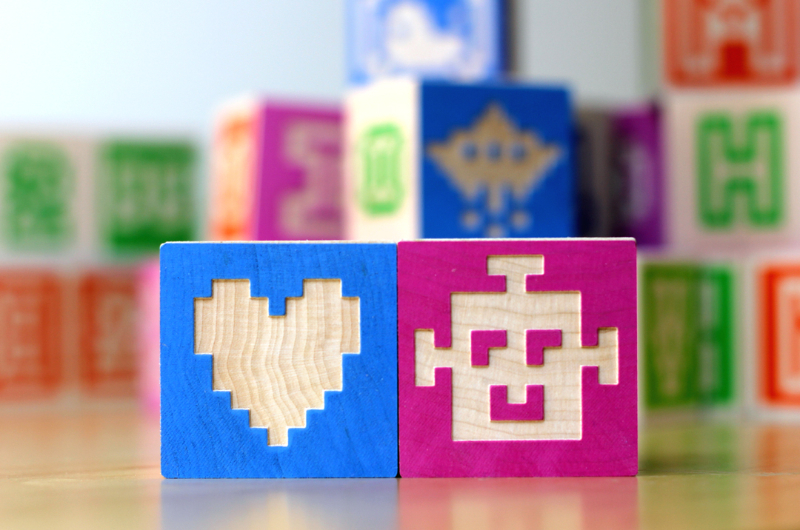 Bitblox alphabet blocks are inspired by the low-res fonts and 8-bit images found on the computer screens of yore. Each image is colorfully rendered on a 13×13 grid, because — superstitions aside — 13 is awesome! …What other prime integer hits that sweet spot just between 12 and 14, huh? Bitblox include every letter (and numeral) at least twice. There are extras of the most common letters. And certain ones do double duty thanks to the magic of rotational symmetry. The combination of characters in each set makes it easy to spell out familiar names and words. 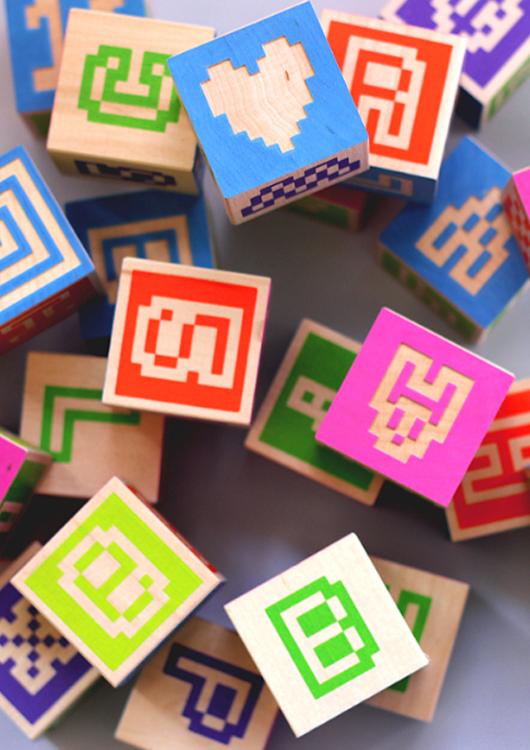 Bitblox also contain a mix of functional, abstract, wacky and nostalgic symbols. A floppy Disk, UFO, Paragraph and Skull? Yup, they’re included, alongside Bubbles, a Fishbone and an Eye. All forever engrained (embossed, actually) onto little wooden blocks you can pick up and enjoy. 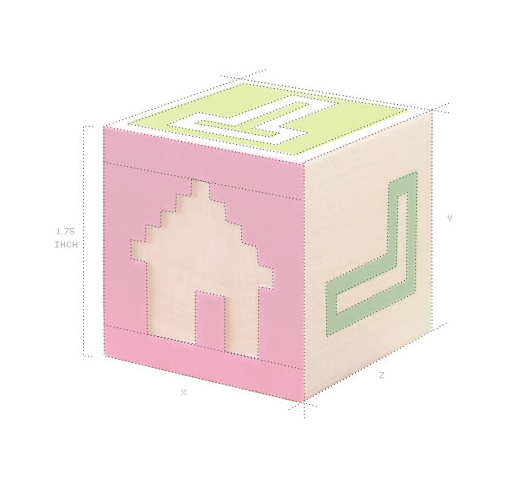 Each Bitblox alphabet blocks set includes a free digital typeface you can install and use on your computer. The fonts can also be purchased separately. Here’s a peek at the eight styles that are available. Jump over to the Bitblox Fonts page for more details. Each set consists of 28 blocks; for 168 images total. Made from high quality, renewable, American grown, kiln-dried basswood. Printed in six vibrant colors: blue, pink, orange, chartreuse, purple and green. Printed using non-toxic, child-safe inks. Block dimensions: 1¾ x 1¾ x 1¾ inches. 56 embossed faces (suitable for paper rubbings). As seen on Boing Boing! As seen on Laughing Squid! Now’s your chance to get the most unique, exclusive and collectible alphabet blocks around — and at a great price! Only a limited quantity is available, so order today.